Beer pairs well with many sports, one being soccer! 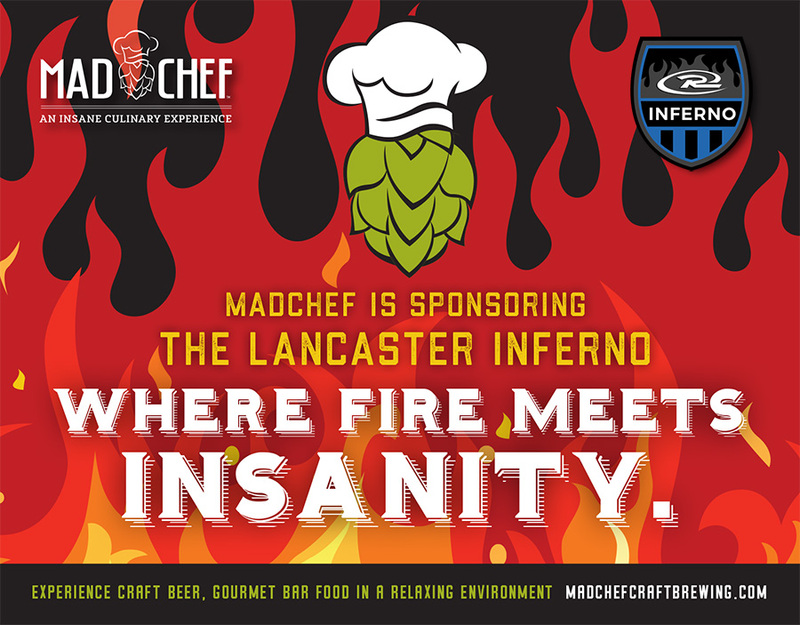 The Mad Chef Craft Brewing Company happens to pair perfectly with the Lancaster County Inferno Rush soccer team. After all, who doesn’t enjoy watching a talented soccer team then afterwards drinking a refreshing beer paired with delicious food? Inferno Rush is proud to announce their second-year sponsor, Mad Chef Craft Brewing Company. Mad Chef Craft Brewing Company is brew pub that can be found on 2023 Miller Road in East Petersburg. Opened in 2015, the two owners, Greg Kendig and Francisco Ramirez, decided to create a space for the local community to enjoy high quality, craft-brewed beer in addition to delicious foods that accent the taste of the provided beers. The menu offers unique culinary favorites but with a Mad Chef spin — like their chicken and waffles, which are served to appear as an open flower and drizzled with a Maple Garlic Buffalo Sauce. Another featured menu item is the mouth-watering French Dip Sandwich served with a side of au jus. Or try one of the favorites of the Inferno coaching staff — delicious fish tacos! Other tasty options can be found on the Mad Chef website or in-store. Interested in meeting fire with insanity? We would love to see you at the field cheering on Inferno Rush and after the game to enjoy food at Mad Chef! Feel free to check our game schedule and Mad Chef’s menu to plan your next outing.